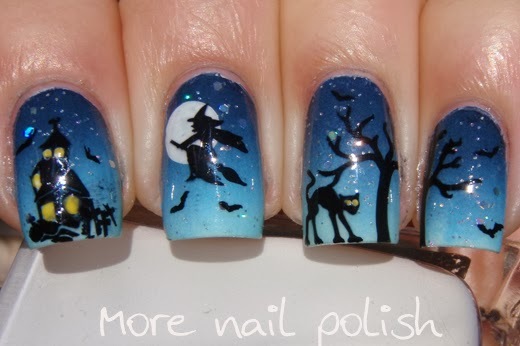 Yes, another Halloween nail art design! Last year I did so many because I participated in a Halloween Nail Art challenge, but I just wasnt up for another challenge this year because I had so many swatches to catch up on after the 31 Day Challenge. 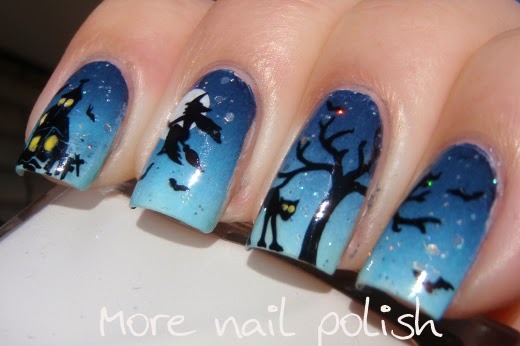 For my actual Halloween nail art, I recreated one of the designs I did last year, with some slight changes. 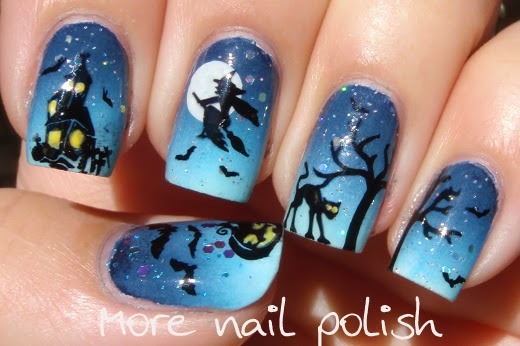 That's one of the reasons I called this mani "The witch returns". I still did a gradient blue sky. This time I used Ulta3 Midnight, Blue Heaven and Blue Hydrangea. For some twinkling stars I added a layer of Picture Polish Glitter Ball, which is the perfect mix of small and medium sized silver holo hexes at just the right density for galaxy or starry night nails. 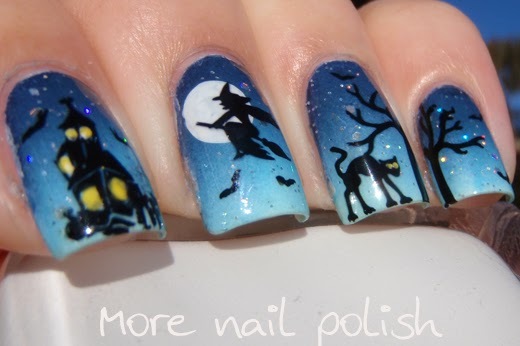 Last years version didn't have the tree or the cat, and I used a different witch, who was flying the other direction, which is the other reason I called this mani "The witch returns", cause this time she is flying back towards her spooky house. Which witch did you like best, this years or lasts? Hee hee, cute story and fun mani. That's a masterpiece! Ooh I hope she won't be causing too much chaos XD Happy Halloween! this is just amazing halloween combo! perfect design! Jesus your gradient is flawless like seriously what's the secret there?